Do car, bus or train trips make you or your child feel queasy? You’re not alone! Motion sickness is common, but unfortunately not very fun! Nothing will ruin a scenic road trip or train commute faster than having your head in a motion sickness bag. Knowing the steps you can take to avoid nausea, vomiting or dizziness due motion sickness can help ensure your next trip stays on course. How can I avoid car, bus, or train sickness? If you’re not driving or navigating, take minute to close your eyes and relax your head. Try travelling at night so you can easily fall asleep during your journey. Skip large meals, caffeine, or alcohol, but reach for the water to stay hydrated. 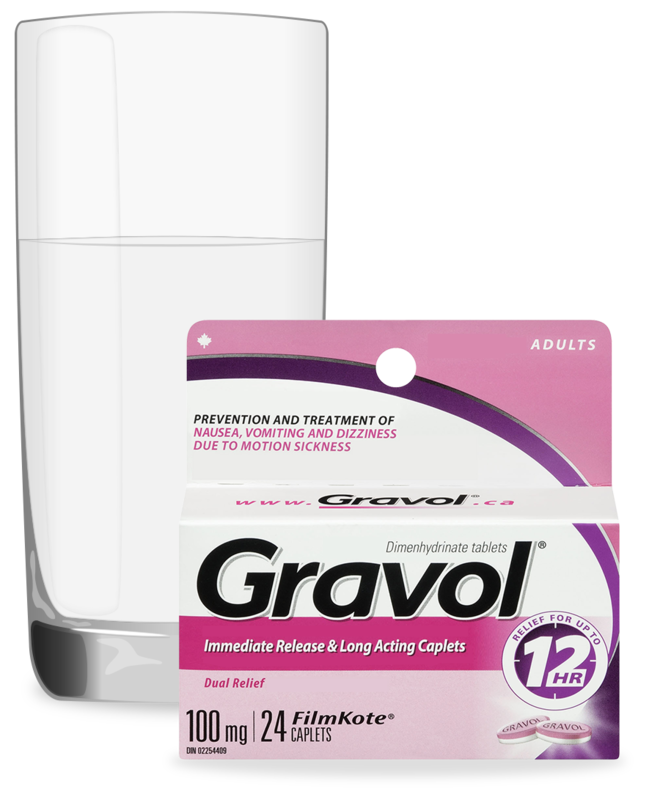 Use GRAVOLTM an hour or so before your departure to help prevent nausea, vomiting and dizziness due to motion sickness. For extra-long trips, GRAVOLTM Fast Acting and Long Lasting Capsules releases medicine for up to 12 hours. If you’re in a car, drive or sit in the front seat. If you’re on a bus or a train, pick a forward-facing seat. Try to look out the window in the direction you’re travelling, not to the side. If your child tends to get carsick, pack a bucket for the car so you’ll be prepared when it occurs. This tip works for adults too. How can I treat car, bus, or train sickness? Start by taking slow, deep breaths to relax. Crack a window or get outside during stops for fresh air. If your child is feeling carsick, play music or a car game to help keep their mind off it. 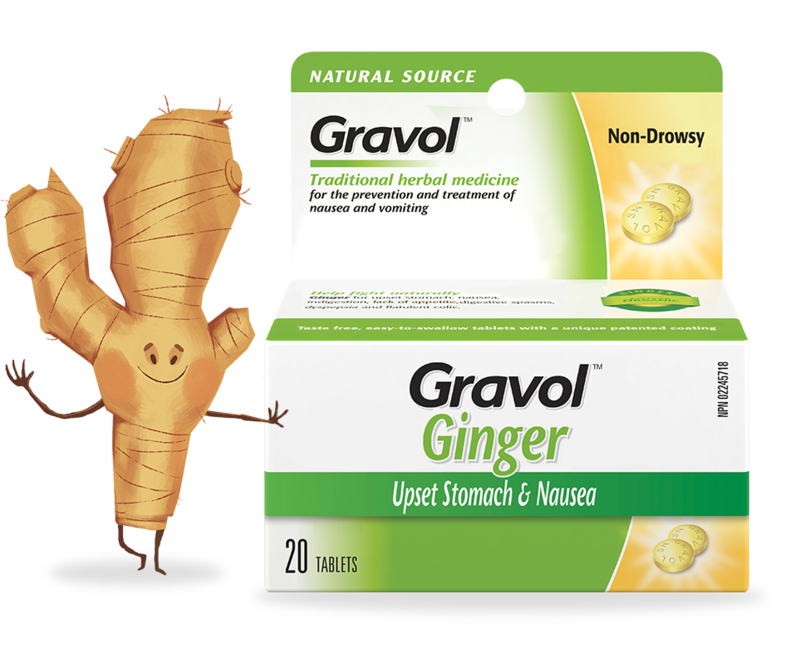 Take a dose of GRAVOLTM to help treat nausea, vomiting and dizziness due to motion sickness. 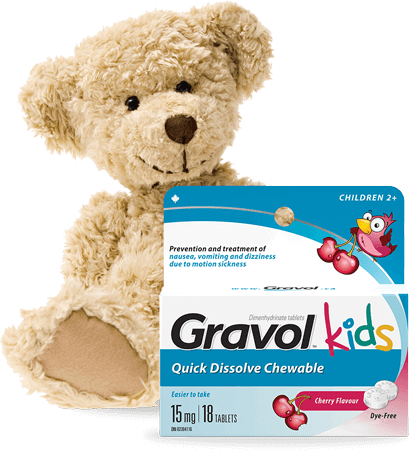 GRAVOLTM Quick Dissolve Chewable Tablets are an easy on-the-go solution that can be taken without water. GRAVOLTM Kids offers a variety of east-to-take formats to keep the little ones from experiencing that dreaded motion sickness. The best way to minimize the effects of motion sickness is to plan ahead. Keep the above tips in mind on your next trip, and don’t forget to pack the GRAVOLTM! The all too familiar, uneasy sensation of feeling like you may need to vomit.